Spring’s baggage allowance is all about offering you choice. That means you only pay for what you use – and nothing more. And remember that when you reduce your baggage you help us reduce our carbon emissions – and ensure a cleaner, greener environment for future generations. So fly smarter and never get stung by excess baggage fees again. Spring Airlines: don’t think, just fly! ・ Carry-on Baggage taken into cabin is ,under Spring Japan’s Regulations, limited to one piece of personal belongings such as a hand bag which can be stowed in the overhead compartment or under the seat in front of you. The maximum weight should be up to 7 kg. ・ Passenger may be asked not to bring in a baggage if we consider it unable to be stowed in cabin safety. 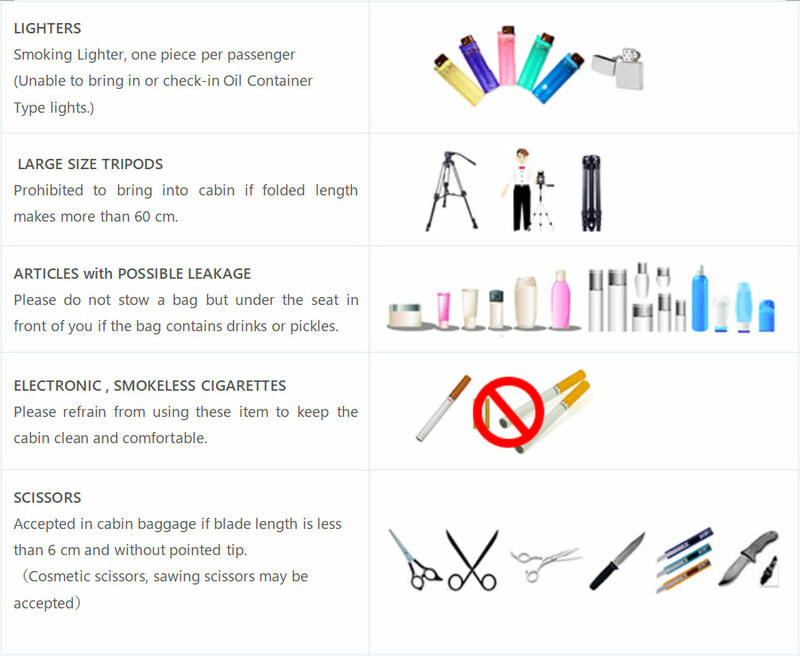 Japan’s Regulations as Cabin Baggage. ・Please bring oversized cabin bags to check-in counter before proceeding to security check area. to return to the check-in counters or throw that item into a disposable box placed in the inspection area. your baggage is free from restrictions. ・Or you can buy an additional seat for your musical instrument or a bag. 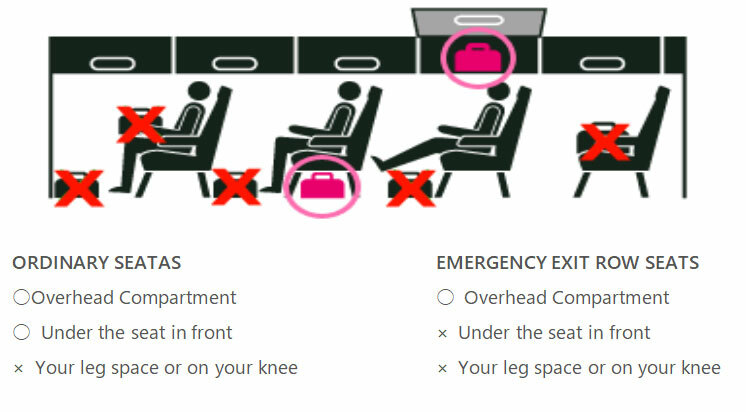 ・ Otherwise your bags if stored improperly, fall down on you and other passengers by unexpected impacts and could cause physical damages on you and aircraft. It may also be hazardous for emergency evacuation. ”Golden Week” or year-end/new year period. Please show up to the airport well in advance. · If you have purchased baggage allowance through internet or Spring Japan Call Center, please print your boarding pass by check-in kiosk and bring it with your baggage to check-in counter. · If you didn’t purchase baggage allowance, please print your boarding pass using check-in kiosk and bring it with your baggage to our check-in counter, then check-in the baggage by paying baggage fee. · Please retain a baggage tag issued in exchange for your checked in baggage and ensure not to lose it up to your destination. Free baggage allowance varies depending on your booked class of service. Baggage charges are not refundable once paid. ・ Oversized baggage rate if charged if three size dimension of your baggage exceeds 203 cm. ・ The maximum acceptable length of Oversized Baggage and Sports Equipment is limited to 277 cm. However, depending on aircraft loading capability, items less than 277 cm. long may not be accepted. We appreciate your understanding in advance. ・ Sports Equipment in Spring Japan is categorized into following 5 items. Hunting, sports and Japanese swords are not accepted as baggage whatsoever. Gold equipments are subject to Gold Equipment Charge regardless what is kept in golf bags or how the clubs packed or stores in the golf bag. ease pack golf clubs properly if not stored in golf bags. You are still asked to pay the Sports Equipment Charge even if the golf bag is empty. Please open the valve on the oxygen cylinder, empty the air inside completely and bring it to check in. Including Short Skis, Plastic Skis for children, Water skis. container or a cardboard box of impact proof level. ◆VALUABLES・FRAGILES： Please do not include in your baggage, such as Cash, Jewelries, Gold, Securities and other valuables, Cameras, PC’s, Bottles and other fragile. Spring Japan shall not be liable for any damage or loss of these items. ◆WHEELCHAIRS・BABY CARRIAGE：One piece or wheelchair, Walking Aid Device, Baby carriage, Child Seat per passenger may be accepted free of charge. ◆Liability for baggage and personal belongings by spring Japan is limited up to JPY 150,000 per passenger. ・　Carry-on Baggage taken into cabin is ,under Spring Japan’s Regulations, limited to one piece of personal belongings such as a hand bag which can be stowed in the overhead compartment or under the seat in front of you. The maximum weight should be up to 5 kg. ・　Passenger may be asked not to bring in a baggage if we consider it unable to be stowed in cabin safety. ・ There are certain restrictions in Cabin Baggage. Please click here for details. You may bring one smoking lighter or a safety match into a cabin of departing fright from Japan but you are not allowed to take them in any departing flights from China. （Including Domestic flights in China） In addition, you are not allowed to include them in checked baggage. If you bring a smoking light or safety matches into China, you are asked to dispose them at security inspection area of departure. Please refrain from using such items to keep the cabin comfortable. Unable to bring in if folded length becomes more than 60 cm. At the security inspection area if any weapon has been detected in your baggage, we ask you to return to The check-in counters or throw that item into a disposable box placed in the inspection area. We ask Your kind understand and cooperation for security inspection enforcement. Under the current regulations, dangerous goods (items prohibited for transport) are not accepted as cabin baggage or checked-in baggage. For details please visit Home Page of MLIT Example) CPAP・Swards MLIT has established very strict standards on specific items and equipment. Please contact our call Center if necessary. Ownership Registration Certificate is required. Battery operated wheelchairs, waling aid devices and batteries. 1. Any liquid in a container more than 100ml(g) is prohibited to bring into cabin. 3. You may not bring into cabin plastic bags of less than 100ml(g) if the bag is not transparent or re-sealable. the liquid or include into your check-in baggage. Gel type items such as tooth paste or hair gel or sprays are also included in these categories of restriction. 5. Please present liquid separately for inspection at Security check area. permitted figure. ・　Or you can buy an additional seat for your musical instrument or a bag. For details, please contact Spring Japan Call Center. ・Otherwise your bags if stored improperly, fall down on you and other passengers by unexpected impacts and could cause physical damages on you and aircraft. ・Maximum weight per piece is 30 kg. ・If the weight of your baggage exceeds free baggage allowance, you are asked to pay applicable Excess Baggage Charge You can check the rate in advance. ・Please retain a baggage tag issued in exchange for your checked in baggage and ensure not to lose it up to your destination. airports. Rates are shown here ・ The maximum acceptable length of Oversized Baggage and Sports Equipment is limited to 277 cm. Other sports equipment is regarded as normal baggage. However, guns and swords including ones for Hunting, sports and Japanese swords are not accepted as baggage whatsoever. Pull out the tires, detach pedals and make and fix steering in parallel position with frame, then pack in a container or a cardboard box of impact proof level. ◆VALUABLES・FRAGILES：Please do not include in your baggage, such as Cash, Jewelries, Gold, Securities and other valuables, Cameras, PC’s, Bottles and other fragile. Spring Japan shall not be liable for any damage or loss of these items.